Many coaches have a hard time making soccer endurance training interesting for their players. It’s no secret that soccer training is supposed to be fun, even when you’re training for endurance. The integrated endurance training shown in our video is much more effective and game-oriented, and it’s also less time-consuming than isolated endurance training programs. The ball is being used much more frequently during our selection of drills. Every coach knows how little time you have to convey the basics on the youth and amateur levels, therefore “Integrated Soccer and Endurance Training” is the perfect coaching tool if you want to maximize the practice time you have. Combine the improvement of technical skills with endurance training. Making your team better has never been easier. We show you how to incorporate interesting soccer and endurance drills into regular team practice. The variety of drills featured in this video play an integral part in the training program of Unterhaching Youth Academy, one of the most successful youth academies in German soccer. 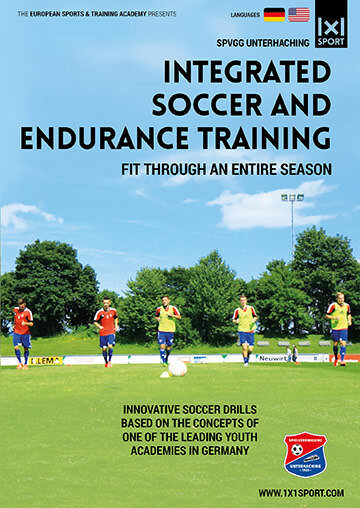 You will receive highly valuable in-depth explanations on the sport-scientific principles that modern endurance training in soccer is based on. Our training methods will allow you to adequately divide your players in ability groups without having to apply expensive testing procedures. Your training program will become more efficient and diverse. As a bonus, we have added a series of speed and agility drills that you won’t find anywhere else. Speed and agility training should be done in an interesting and game-oriented way similar to endurance training. The large variety of bonus drills shown in this video can easily be integrated into team practice. This allows you to combine the training of speed and agility with soccer aspects such as ball control, crossing, finishing and many others. Replace demoralizing runs through the woods with state-of-the-art speed and endurance training. This training video is the answer to all your questions related to endurance training. Your players will appreciate your new form of training and your efforts will pay off! Learn how to integrate endurance drills into your regular soccer training routine. Make endurance training more fun and entertaining with a variety of game-related drills. Bonus: Integrated speed and agility drill series.